At long last, our streak of gray rainy weather seems to have passed and with the sunshine, the garden has burst into bloom! I was a bit worried about my roses as in the autumn, the Colorado Front Range went from endless weeks in the mid 70's all the way into November without a single freeze. Then literally overnight, our temperatures plummeted to below zero and stayed there for a week or more. All the trees and shrubs were still in full leaf and the roses still blooming. Early this spring, I had to cut the roses all back hard, just a few inches above the graft for those with such. Not an easy start for newly planted roses! Over the past few weeks they have grown like mad, and just this week have burst into glorious bloom! 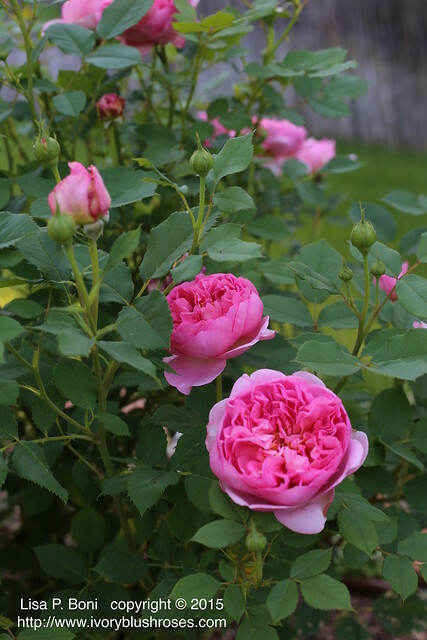 This lovely rose is "Lady of Shallot" by David Austin. 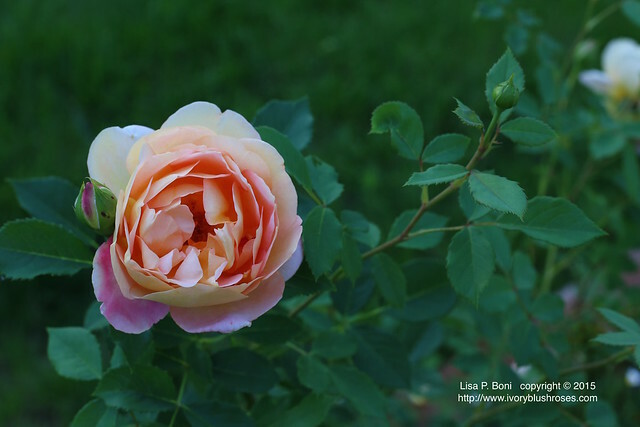 She is sweetly scented and I am really loving the blush tinged apricot color! 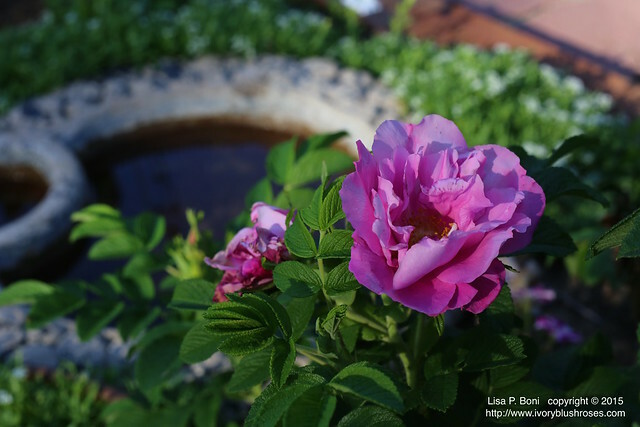 Last summer, this "Boscobel" rose, another David Austin English rose graced my garden with nearly endless blooms from the time she was planted until that horrifying freeze. It looks like she's gearing up to do it again! So lovely! 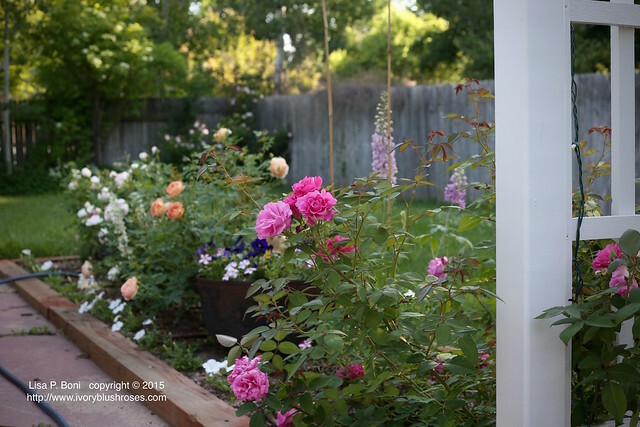 I planted two rugosa roses in amongst the English roses. 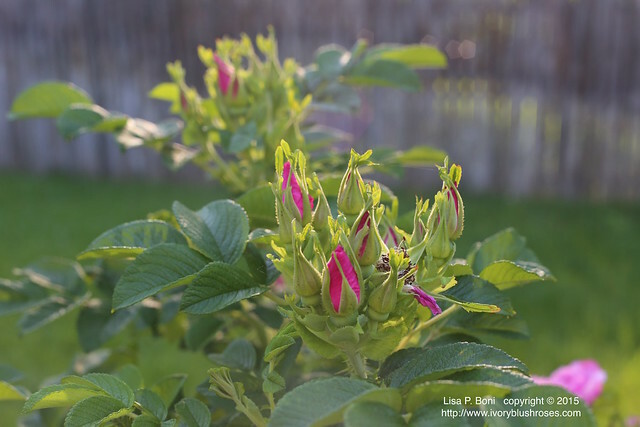 Love their clusters of perfect rosebuds and later, the huge orange rose hips that they will produce! This "Evelyn" Rose is the most fragrant of all the roses. I understand that in some places it is grown specifically for the fragrance and it's use in creating perfume oils. 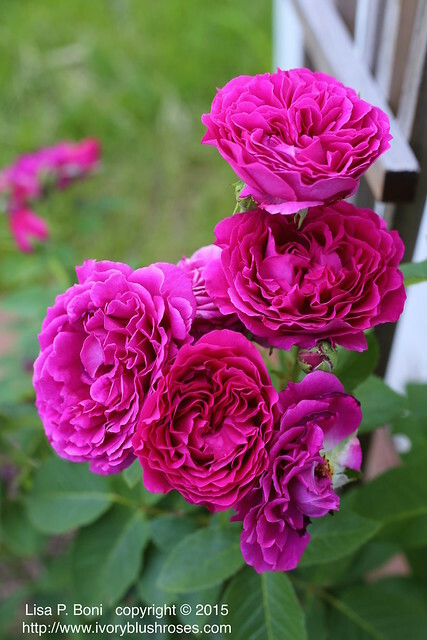 It also seems to be the most tender of the David Austin roses that I have planted. I thought I had lost it completely, but it has managed to send up a couple of sturdy branches that are crowned with beautifully fragrant blossoms! They are such a nearly perfect "Ivory Blush Rose", don't you think? Love the big tissue papery looking blossoms of the rugosa roses! This brilliant beauty is a climbing "VooDoo" rose that I found at the garden center last year. I have high hopes that by year three or four, it will be strong enough to climb up the wall and onto the roof of my garden shed! There aren't just roses blooming in the garden! 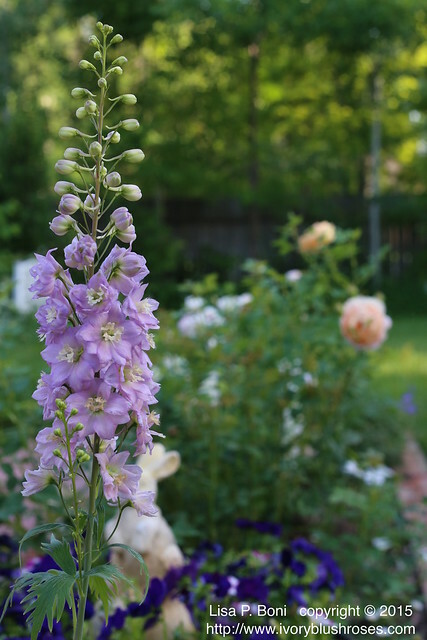 I can't decide if this delphinium is really rose colored or more lavender. Regardless, it's a beauty! In the side gardens, things have grown profusely! The red and white valerian is lush and beautiful this year as well as the Stachys. 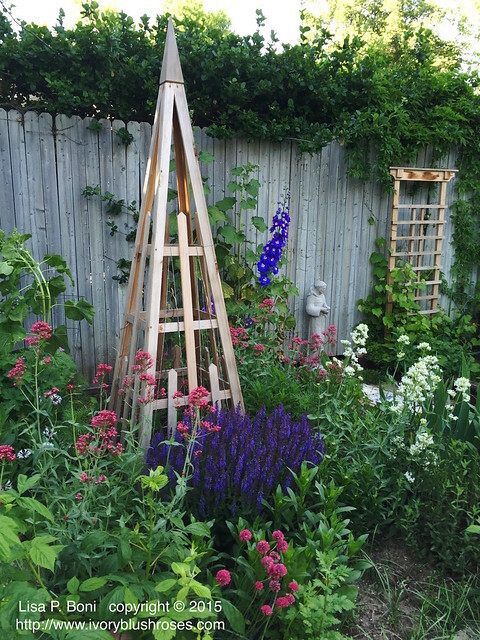 In the back, there are delphiniums and hollyhocks just starting to bloom! Because of the wet weather, I didn't get the sweet peas or morning glories planted on the tuteurs, but that's ok as I like actually being able to see them in the garden! Last year, the flowers covered them so completely that they became invisible! The small trellis to the right rear has grapevines from my Uncle David growing up them! My Mom always grew feverfew. And my dad pulled it out by the wheelbarrow-full. It was a huge bone of contention between them! Makes me smile now, but I do remember some rather harrowing arguments between them about all that feverfew! Last year, I was gifted with a few plants and they are growing happily! I hope to find a balance with it - to not have it run quite as rampant as my mother's nor as sparse as my dad would have had it! The comfrey is completely out of control and would happily take over the entire garden if allowed. The bumble bees love it as you can see. It's swarming with them. 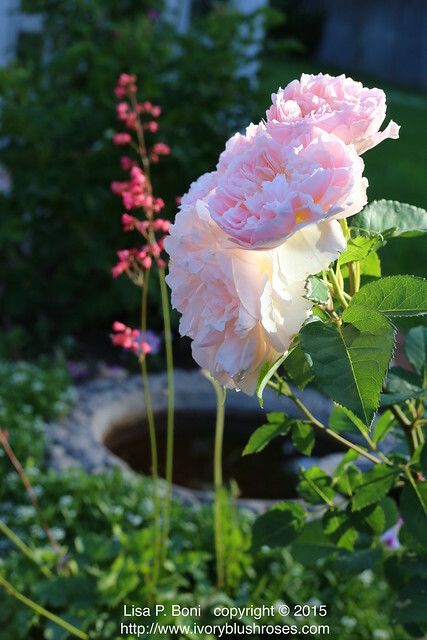 But as the blooms finish up temporarily, I'll be cutting it back hard and digging a good portion of it out and attempting once more to contain it to it's own corner of the garden bed. 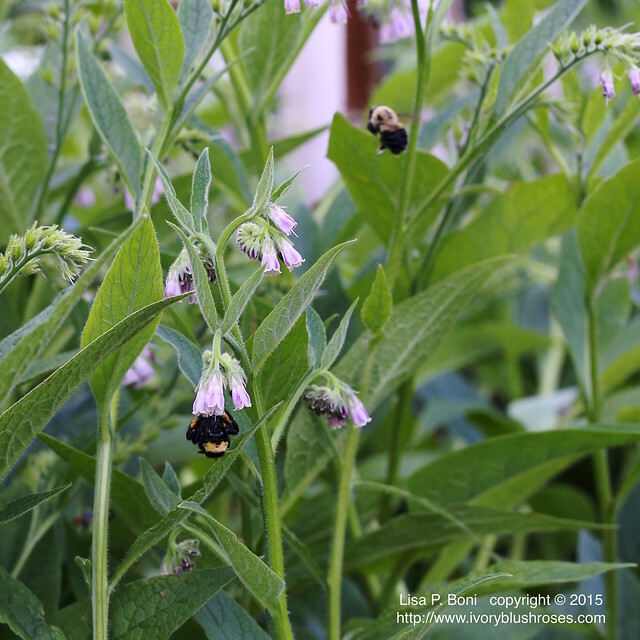 In the end, I suspect the comfrey and bumblebees will win out, but I'll try anyway! Spending time in the garden is rejuvenating. I don't get to spend as much time there as I'd like. There is stitching to do after all! (and pesky things like a full time job and housework to do). But I love the few hours a week I get to spend tending the flowers and enjoying them. Now if I could just figure out a way to get the mosquito population under control then life would be truly grand! I don't believe in spraying for every bug, critter, and weed that inconveniences me, so for now I'll keep applying bug spray to myself and enjoy the wonderful diversity that occurs in my little corner of creation! There is a bit of crazy quilting to share as well! It's always good to learn something new, or at the very least, a new way of looking at things. I took Kathy Shaw's Basic Crazy Quilt Class that started back in March and finished it a couple of weeks ago. I opted to stitch primarily in shades of purple and blue with my favorite shades of green. Love how it turned out! It was interesting to use the PVC embroidery frame, and I do like how crisp everything looks when completed. I must admit that it slowed me way down and I missed being able to hold the stitching in my hands the way I am used to. I think mostly it was the bulk of the PVC frame that bothered me. So, I've ordered some smaller wood stretchers and tacks to try in hopes that it will feel less bulky in my hand and I can get this nice crisp smooth look that I like. It was also new to me to use templates for every seam. While I do occasionally mark seams, I rarely do every one, preferring to have that slight variation in stitching that shows the human element. To my eye it makes things a bit more relaxed and peaceful somehow. That said, I can see that I will use a template now from time to time, especially on some of the more complicated seams! It was a terrific class ~ Kathy has put a huge amount of time and effort into her handouts and class format and it is well worth taking her class! 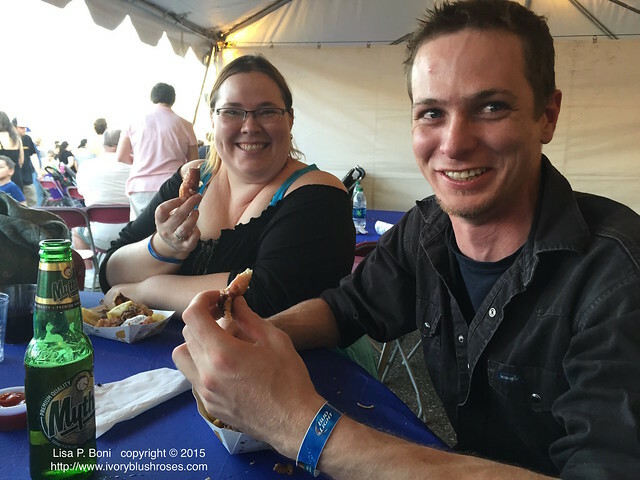 This weekend, I got to spend some time with a couple of my kids at the Greek Festival in Denver! This year marked their 50th anniversary of the festival and I can say that I've been attending nearly that entire time. While I have had to miss a few years due to work schedules or being out of state, I've managed to attend a majority of the time! 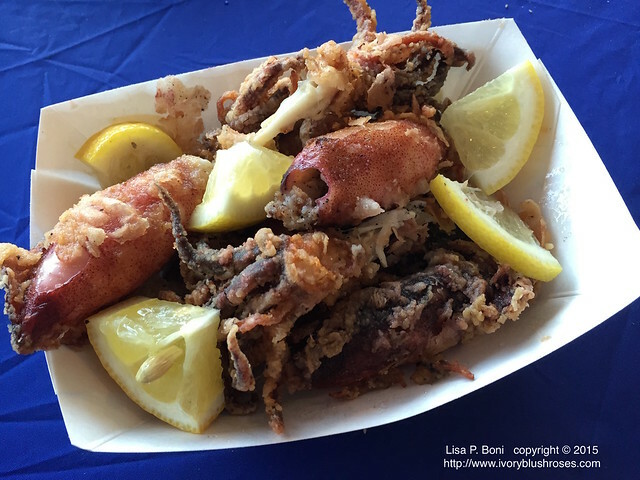 The calamari served at the festival has to be the best that I've ever had! 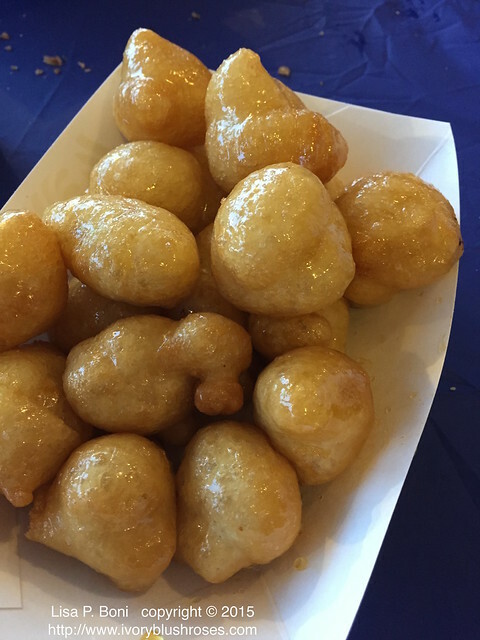 And the loukomades (tiny donuts glazed in honey) are the perfect ending to a wonderful meal! 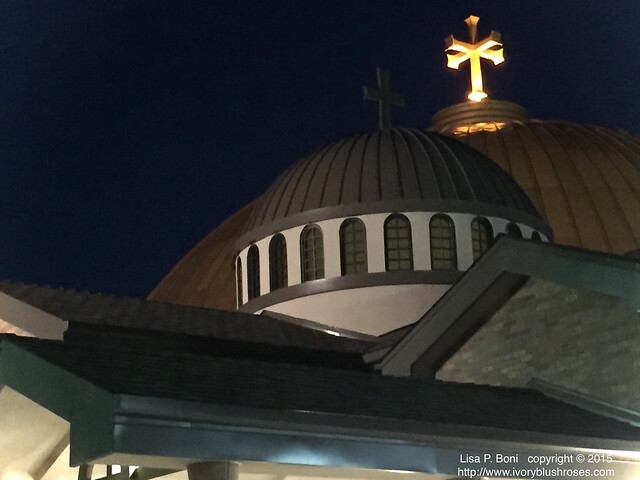 Normally, I take photos of the gold dome of the church in the setting sun, when it glows with light. This year, I was too busy eating calamari to do so, but I captured this photo with my phone as the evening progressed. And finally, in celebration of Father's Day, a photo of my Dad. 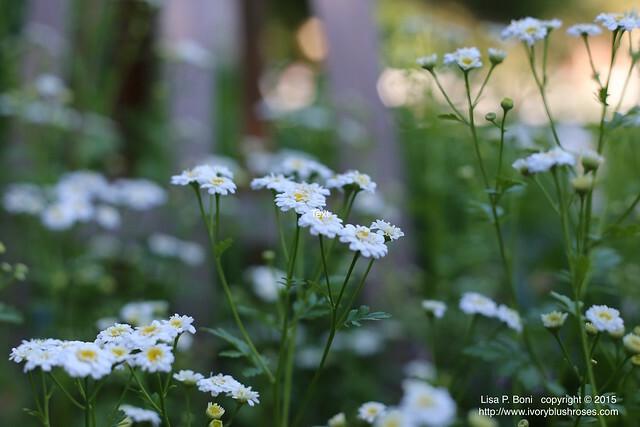 In fact, this photo was taken on one of those days where my folks had a knock-down, drag-out argument over my Dad weeding out the feverfew indiscriminately. It was in the days when his Alzheimer's was starting to really show and he had a one track mind. My Mom was spitting mad, just seething with it, and her anger just made him weed all the harder! To make peace, I sent my mother inside and managed to distract my Dad from weeding by telling him that I wanted to take his photo and got him to another part of the yard where feverfew was few and far between! He happily posed for me for quite a long time and peace reigned in the house at last! Oh, how I miss my Dad's gentle ways and impish sense of humor. 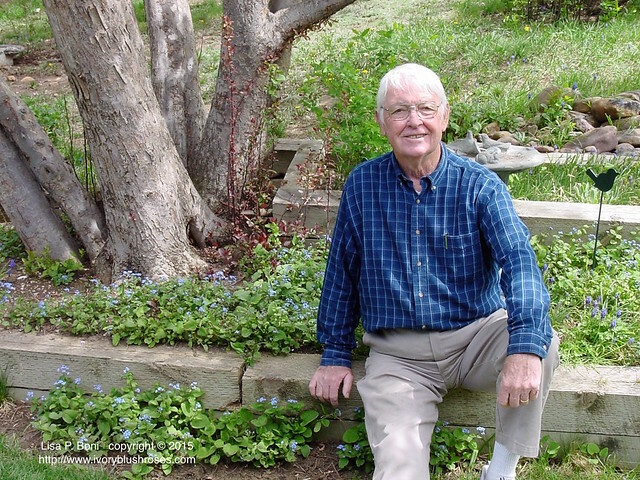 He truly was one of the world's kindest and gentlest of men, slow to anger, every word that came out of his mouth well spoken, and so honorable. He was the complete opposite of my mother in so many ways. Where she was outspoken and gregarious, he was quiet and somewhat shy. When she was volubly angry (like Mount Vesuvius! ), he sat back in quiet contemplation and let things pass. But they were a good pair, a good balance for one another. And to my sister and I, the best of parents in so many ways. Happy Father's Day Daddy. I love you and miss you! What a lovely post with your beautiful roses and flowers and your wonderful, exquisite stitching. I love the piece you just did. WOW! More beautiful pictures! But a question today: what do you mean by a "template at every seam"? 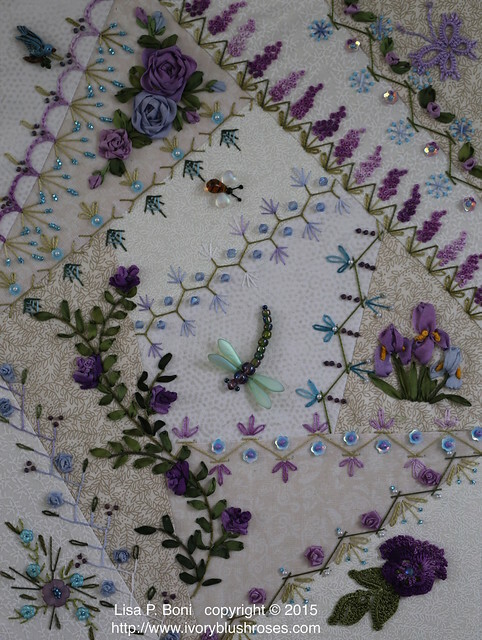 The inspiration from your garden to your stitching is fabulous. I would love to come and sit in your garden and stitch. It's beautiful. Lisa, Song of Solomon is one of my favorite books of the bible, and this verse is one that is the most beautiful and speaks to me. Gorgeous post, thank-you for the day brightener! The roses are just out of this world. They are so full they resemble the bloom of a peone. Wonderfu/beautiful!!!! We grow comfrey in the bottom of the garden, Lisa, because it makes excellent compost. Just whack it off and compost the whole thing. It will assuredly grow back. We shred the fresh leaves and put them in the bottom of holes we are transplanting plants into, too. Beautiful space you have created in the world. Absolutely beautiful.